It is recommended that you upgrade your browser with one of the following links. This way you will be able to view the following information as it was intended. This year marks the grand opening of the new 2800 square foot log cabin and custom kitchen. Sleep in a log bed, sit by a roaring fire, and cook in the new kitchen. Camping and sleeping bag parties in the yurt are still open as well. You choose! Call for room availability. Lodge room rates- $10 per weekend seminar, for a shared room. $20 for a single. The lodge is located across the road and up the hill- about a 5 minute stroll from the lower willow farm. Parking is easy. We also have 24 acres of new woods to explore. Come and check it out and celebrate the year of the Tiger and our new addition. 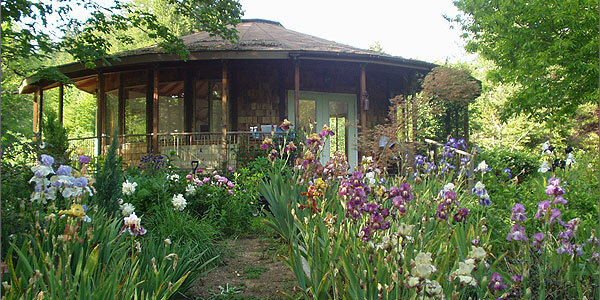 Ancient Arts Center is situated in Lobster Valley, one hour from Corvallis and one hour from Waldport in the lush mountains of Oregon's Coast Range. Facilities include a 700 square foot round classroom, guest house and kitchen, campfire circle and outdoor house, rambling country gardens packed with colorful flowers and a serene green woodland and shady creekside for swimming, dabbling in rocky pools or basking on the bedrock benches. Classes begin at about 9am on the starting date and end at no definite time in the afternoon. People may arrive on the night before in order to get settled in and leave on the following morning especially if they have a long drive. Please come prepared to camp in any weather or bring a pad and bag and sleep in the guest house or the yurt. There is one side room, one attic room and the main room in the guest house, and one large room in the yurt, so be prepared for a slumber party. There are cats on the property so let me know if you have allergies. They do not go in the yurt at all. Our summers are generally warm and dry but there is heavy dewfall and there can be thunder showers. The winters are very wet so be sure to bring appropriate clothing and a warm sleeping bag. For those who wish to commute, there are lovely hotels on the Oregon coast one hour away in Waldport, Yachats and Newport. The nearest airports are Eugene (1.5 hours) and Portland (2.5 hours). Bring your own personals kit such as towels etc. and personal foods for all meals. Earplugs may be a good idea for sleeping. Other things you may want to bring include sun screen, sun glasses, and a swim suit in summer; and a hat, gloves, rain gear and rubber boots in winter. If you drink coffee, please be prepared to make it. The well is very sulphurous so many people bring bottled water. We will do potluck style dinners depending on the wishes of the group. There are full cooking facilities including 2 four burner ovens, a microwave, rice cooker, and campfire (in summer). There are 2 refrigerators available and guest dishes. The fridge may freeze things depending on its mood this year and coolers may also give you more space. Bring a strong flashlight or lamp for finding the bathroom at night. Supplies: For most classes you will need a small sharp knife such as a paring knife or swiss army knife. Exacto type blades are not strong enough for most classes and hunting type knives are too big. Your knife should be comfortable in your hand. Also bring a small awl such as a leather working awl or an ice pick, scissors, garden type clippers, a soaking bucket or bowl, a spare hand towel, and a spray bottle for water.